We Have Some Of The Best Spray Air Fresheners Around! They Are Long Lasting, Great Quality, With A Variety Of Scents For Your Car. 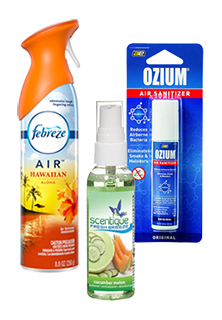 We Have Several Brands Including But Not Limited To; Glade, Febreze, Citrus Magic, Scent Bomb, Scentique, And More. You Must Check Out Our Spray Air Fresheners Now! We Have The Lowest Prices In The Nation~GUARANTEED!